It's Friday, March 21, and time for Facebook Fridays! 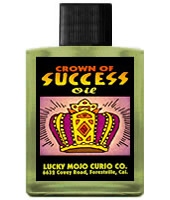 This week's giveaway features Lucky Mojo brand Crown of Success products. Are you starting a new job? Planning a social event? Opening a store? Taking a test? Speaking in public? Publishing a book? Running for public office? Enrolling in a course of study? Entering a contest? Crown of Success is just the thing for you! This week we are giving away 7 prizes in a random drawing. The top winner will receive a custom-made Crown of Success Mojo Hand, complete with dressing oil. 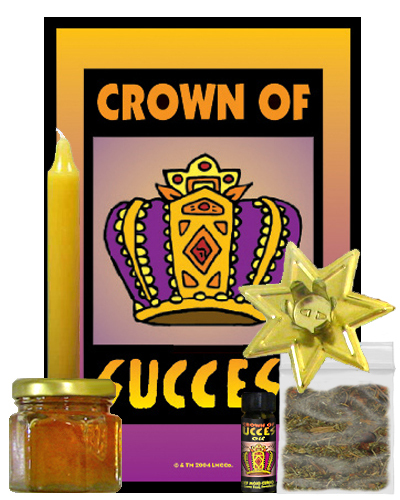 Second place prize is a complete Crown of Success Honey Jar Spell Kit with all ingredients included. Our third place winner gets a hand-fixed and dressed Crown of Success Vigil Candle. And four runners-up each get a Crown of Success Oil or Sachet Powder, or Incense Powder, or Bath Crystals. All you have to do to enter is to go to the Lucky Mojo Facebook page, scroll down, and post a comment to the Facebook Fridays! status message for March 21, 2014. First thing tomorrow morning, we will select seven winners at random, announce their names here, contact them via Facebook to get their mailing addresses, and send them their FREE Crown of Success products. We have a winner! In fact, we have seven lucky winners! Our Facebook Fridays Giveaway winners for March 21, 2014 are: Christian Marsland, Aimee Brown, Corey Jo Cattedra, Shanna Talley, Crystal Lyn, Toni DeFraine, Ruben Nieto.